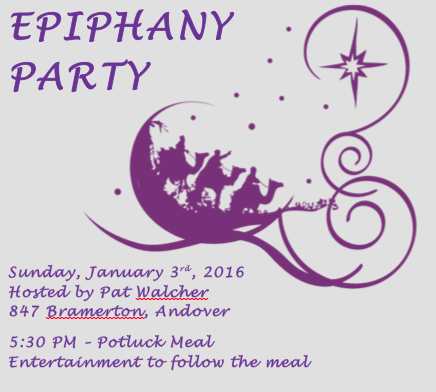 Plan now to attend our Annual Epiphany Party, a time for fellowship and friends after a busy season! Jim Jones is working up a special treat for entertainment after our Potluck Meal. The Wichita AGO Board will provide the main dish. Members will be invited to bring a side dish or dessert to share, assigned by Carolyn Chambers at a later date. Please be sure to RSVP by contacting Pat Walcher. Invite someone to attend with you! Go east on 13th or Central to 159th. If on 13th, turn South (left); if on central turn North (right). Go about 1/2 mile to Terradyne (pretend you are going to the Hereford House). Go past Hereford House to the traffic circle. Stay to the right; DO NOT go around the circle. 847 is the gray house on your right. Street signs are hard to see because they are on brick pillars. There is one in our yard by the circle.